New CID Cosmetics-Scarlet / Burberry-Military Red / Clarins Instant Smooth Lip Balm- Crystal Red Summer Collection'12 / Clarins Colour Crystal-Red Summer Collection'11 / Korres Lip Gloss-Red Pink / Miners Matte Factor Lip Cream-Deep Red. 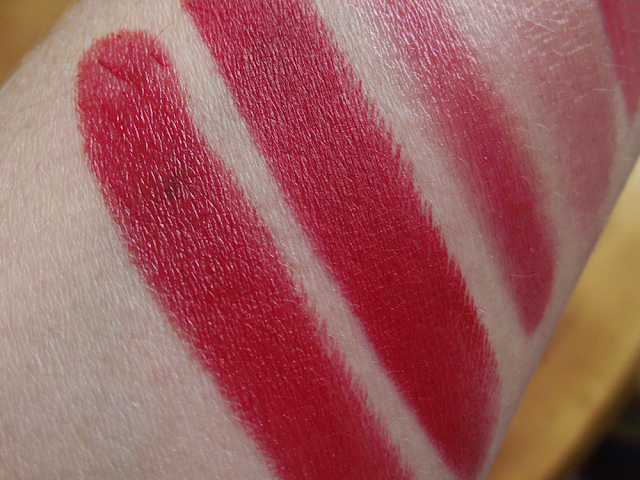 After taking swatches of the lipsticks it soon became evident that Scarlet is in fact a dupe for Burberry's Military Red. The only difference being the finish, Military Red is a matte finish where as Scarlet has a sheen to it. Both gorgeous shades! 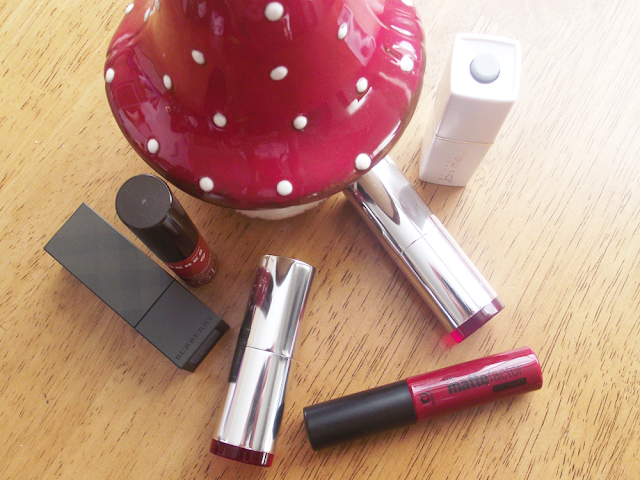 I love digging out my red lipsticks and stains this time of year, especially for winter and party season! 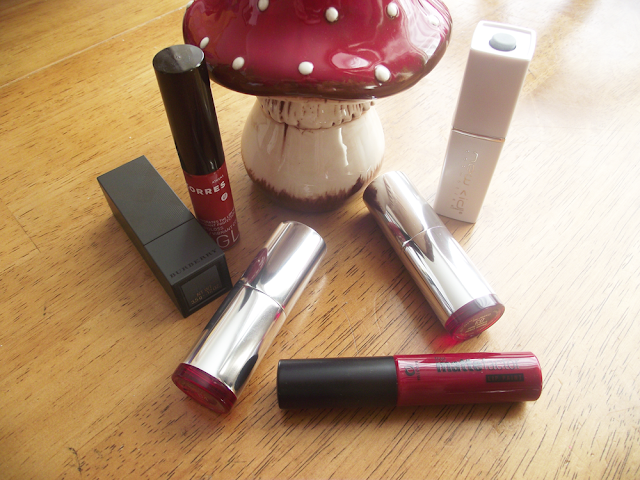 Here's a small selection of red lipsticks which I reach for, whether that be day time or evening. Some are very bold whilst a couple or so are very mild and great for anyone who would rather pass on the bright bold traditional red lip. 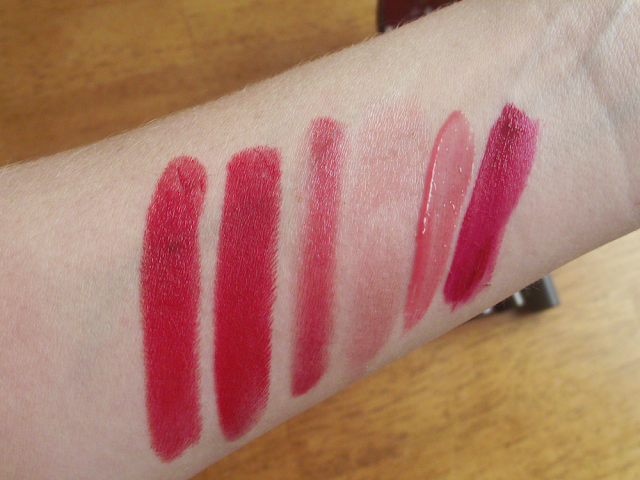 There's a red shade out there for everyone, just have a look and take your time to swatch them in the shop. I would make sure you line your lips first and cover them all over with a lip liner and don't forget your lip balm first! I swear by the Blistex Relief cream. I would love to know your top Red Lipstick for Winter? I have the red lip from the Kate Moss Rimmel Collection on my wish list! I'm a fan of MAC's Hot Tahiti! It's perfect, not too in-your-face.